So … I was a bit nervous about this race. 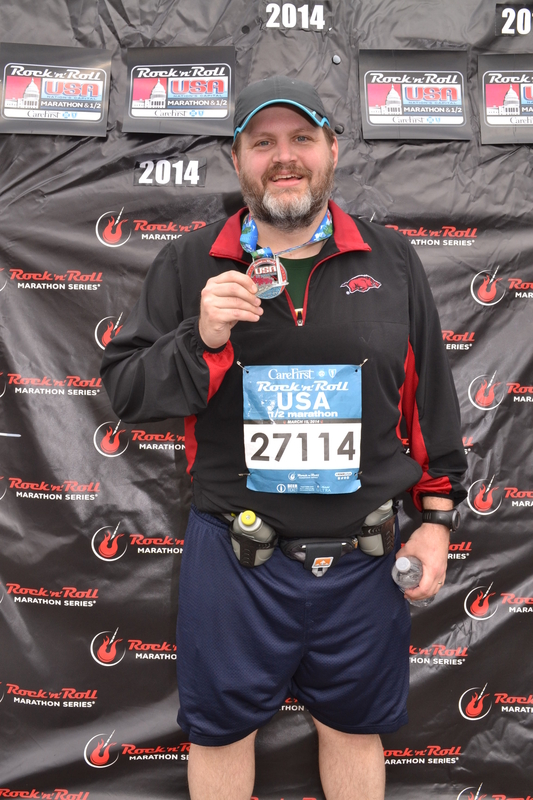 My original registration for Rock ‘n’ Roll USA was for the full marathon – it was to be my first. And then I learned why people that live as far north as I do don’t often register for early spring marathons. As I got further and further behind in my training, I realized that I was not going to make it … and so I switched over to the half and took a deep breath. And my training was not really great even then – just too many distractions excuses and such. And I even entertained the thought of backing out altogether. And then I realized that was crazy talk. Even if I had to walk it, I could do it – and even with relatively poor training I’m in better shape than I was last September when I did the half in 90 degree heat. So I committed to making it happen, and I am so glad I did. This was an awesome race. Got to the expo on Friday afternoon and was confronted with a line out the door. That wasn’t the Rock ‘n’ Roll folks, though – because the expo was in the DC Armory we were being screened by security. That went quickly enough, and then I had no wait at all to pick up my number and get to the shopping. My wife and 2-year old were with me on this one, so that got interesting – and a great big THANK YOU to the folks at the Williamsburg Marathon booth that gave him the Chik-Fil-A stuffed cow. Anything to distract him at that point. We were staying at my brother-in-law’s house in Alexandria, which is on the metro. My morning nutrition was not optimal: granola bars at their house and a banana at the race. Not enough, but that turned out OK. WMATA opened up the metro two hours early, and getting to the start could not have been easier. It was so easy that I’d left myself entirely too much time and wound up needing to kill an hour. This was easily the biggest race I’ve ever been a part of – I was in corral 27 and there were an awful lot of people behind me. If you’ve ever done a Rock ‘n’ Roll race you know there is a ton of energy at the start line, which is nice … because it took 45 minutes for me to get to the start line. And we were off. The course itself was absolutely great, and we got nearly perfect weather. We started on Constitution Avenue – my corral was directly in front of the Smithsonian Museum of Natural History – and headed down the mall. In the first mile we ran past the Washington Monument and the White House headed toward the Lincoln Memorial. Mile 2 was an out-and-back on the Arlington Memorial Bridge with a gorgeous view of the cemetery. Miles 3-6 were up the Potomac Parkway, so relatively quiet but very pretty. Another very interesting thing happened at roughly mile 9, just before we turned south on North Capitol Street and had that gorgeous view of the US Capitol. I’ve been in races where somebody random sets up a table with “Free Beer!” or “Mixed Drinks!” These are awesome, but not for me. And so I almost ran by one of these tables until I realized the sign continued. “Free Beer” was followed by “Free Brisket!” And, yeah, I couldn’t not check that out. And while a big ol’ slice of brisket is non-traditional mid-race fuel … it was incredible. After we turned off of Capitol Street we wound through different neighborhoods for the last 4 miles or so for a finish at RFK Stadium. The marathoners and half-marathoners split up just before mile 13, and the thought at that time of taking for another 13 miles made me cringe. That’s going to happen, but not soon. My family missed my finish by about 10 minutes, which legitimately sucked, but I was very very happy with my race. My pacing was remarkably consistent – the fastest mile was mile 4 at 11.15 (because that’s always my best mile) and my slowest was mile 7 at 12.37 (because hill – 271 feet of elevation gain in that mile). My overall time was 2:36.0, for a total pace of 11.54 / mile. That takes nearly 19 (19!) minutes off of my previous half marathon time. I also set PRs with my official 10K (1:13.04, nearly a 2 minute PR) and 10 mile (1:58.34) splits. Here’s where I think I am – this is the race I had expected hoped to run in Virginia Beach last summer. The conditions forced a much different race, though. But I’ve been able to maintain that level of fitness through this winter even though I don’t feel great about my training. The huge PR is a great validation of where I’ve gotten to – and I am feeling very motivated to blow right past here. I’ve got another half scheduled for late spring, and I hope to blow that one away. In the meantime – I LOVED this race. The Rock ‘n’ Roll people did a great job with everything as far as I could tell. And the overall vibe from the competitors, spectators, and city was just some of the most fun I’ve had running. Thanks for everybody that worked on it and came out to cheer – you made it an awesome experience! – Apparently the Rock ‘n’ Roll folks had some troubles at this race last year, especially with port-a-potties and the gear check. They made a lot of noise about listening to the complaints and changing things, and by all accounts they got it right. While there were lines at the port-a-potties throughout the race, the start and finish seemed to be fine. And I didn’t check a gear bag because my family was coming, but the feedback is that they fixed that, too. Kudos to the organizers for making it happen. – Speaking of port-a-potties, I had to make a pit stop just past mile 9 and lets just say that glad I’m a guy and move on. – I struggled with my fuel belt, strictly due to lack of practice. I started the race with it on my back, but the way it bounced and pushed on my shorts was not comfortable. So I turned it around like you see in the pictures up there … which blocked the pockets I usually keep my iPod in in that pullover. 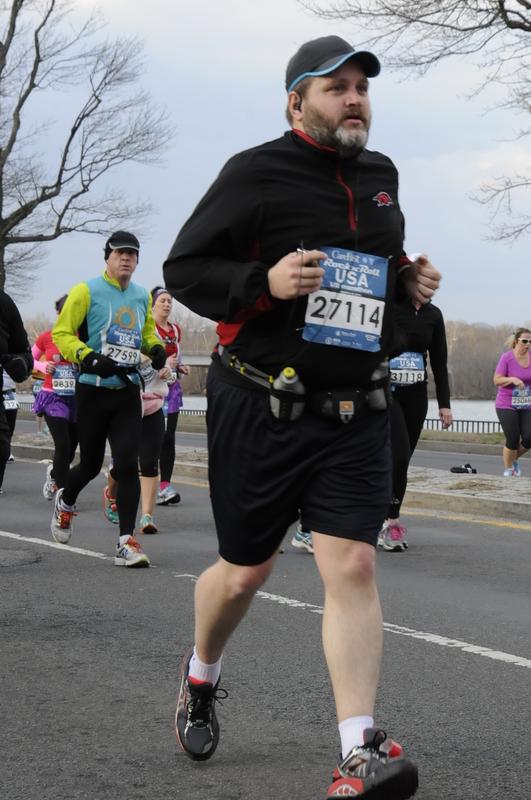 So I wound up carrying the iPod in my hand for most of the race. The two times I tried to put it in the pocket interfered with the water bottle in the belt and made it fall out. So … in the hand it was. That’s what I get for using something I hadn’t used in 6 weeks. – For whatever reason the nutrition didn’t hurt me. I started fueling with gel relatively early and I think that helped. – It turns out that I’ve become a bit of a snob about walkers. Not that I mind the walking, mind you – I do some of that myself. But, for the love of Joe Pesci, when you are going to stop and walk move over to the side of the crowd. Especially in the first mile or two when there is still a lot of congestion. – At around mile 25 for them the full marathoners came around the back of the parking lot where the finish line festival was. My son and I walked over to cheer them on for a bit. I’ve just got a ton of respect for those folks … they’d been running for 4 hours or so and just looked beaten down. I can only imagine how they felt when they finished. I want to feel that some day. – Not really any SWAG at this one, which is interesting. The shirt is a Brooks technical that I like but caused some bitching because it is black. People will complain about anything, I guess. We got that and our gear bag and a couple of random little medical things (basically icy hot) … but that’s OK. I did pick up my pint glass and 13.1 sticker, and then we did a little damage at the expo. I intended to get my medal engraved like I did at Virginia Beach, but the wait was too long. That does not take away from the medal, though, which is pretty awesome. – That was March’s race, which means I’ve now run in a race or an event in 13 consecutive months. I am registered for a 5K in April, another half marathon in May, and a 5-miler (automatic PR!) in June. Targeting an 8-miler (another automatic PR!) in July and a 10K in August. And then Ragnar Tennessee in October. So when I get September figured out that gets me to 20 months. Who’d have thunk it? 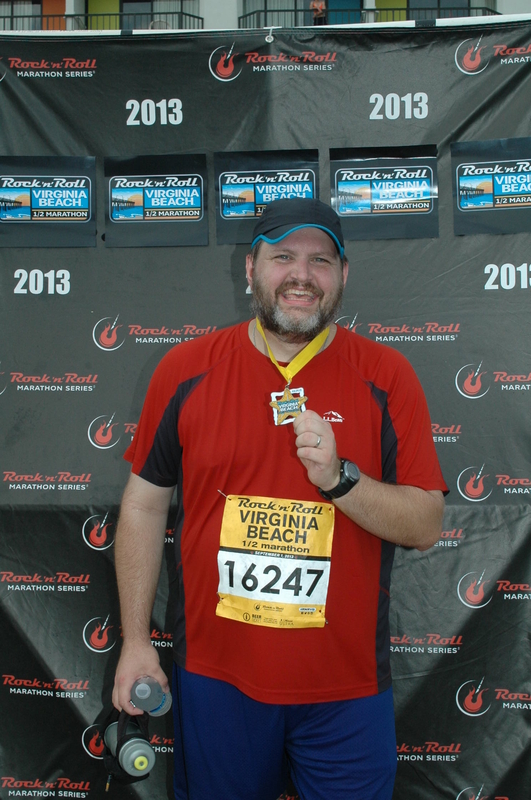 Today I changed my registration at the Rock & Roll USA event from the marathon to the half marathon. And I’m having a bit of a sad. There are a lot of excuses reasons, but the bottom line is that I’m not ready. And I don’t have enough time between now and then to get ready. My primary goal when I attempt a marathon is to do the most possible to set myself up for success – which is defined as finishing within the time limit. I’ve seen enough examples of folks that rushed into their first marathon and felt relatively strong right up until mile 20 or 22, when they were asked to leave the course and bussed to the finish line and given a medal. I don’t want that. I want to cover all 26.2 miles myself. And I want to know that my medal is a true “finisher’s” medal. This is not to take away from those that have done that and are proud of it – however you earned that medal, you have a right to be proud of it. But I want my experience to be different. I just do. For the record, I’m not hurt. I’m just dozens and dozens of miles behind in my training, and the way the weather and my calendar are going I’m not going to be able to make it up. And, therefore, it is time for a change. Physical – This is going to hurt at some level. Your body physically commits to doing this, and as you start pushing the edges of what you consider possible you are doubling down on the physical commitment that you made. Time – I have spent hours and hours running to get ready for this. My 16 mile run last weekend took over 3 hours alone. And though I understood there was a time commitment, I don’t think I fully understood how difficult it is. One often overlooked element of this one is that a commitment you make of your time is not just yours – your family shares in that commitment. They give up that time with you, and so they had better be on board. That was not an acute problem for me – my family has been very supportive – but I am acutely aware of their commitment, too. Emotional – There is a certain level of energy required to mentally prepare for a marathon. And a large piece of that requirement involves believing, all the way down, that this is something that you can and will do. You have to make success a part of your emotional core. This marathon “thing” becomes like its own living entity within you. And when it comes time to think about letting it go … that’s an emotional decision, and making it comes with emotional baggage and, frankly, a mourning period. My mourning period just started. I am hoping it goes quickly and I can start embracing the new half marathon PR that I’m going to go get. In the meantime, I will try and dwell on how great it feels to be in good enough shape that I can consider running a half marathon in 6 weeks not just achievable but, without injury, a done deal. In the long run I don’t want to settle for that … but for now, I will take it. Also – I’m ready for spring now. 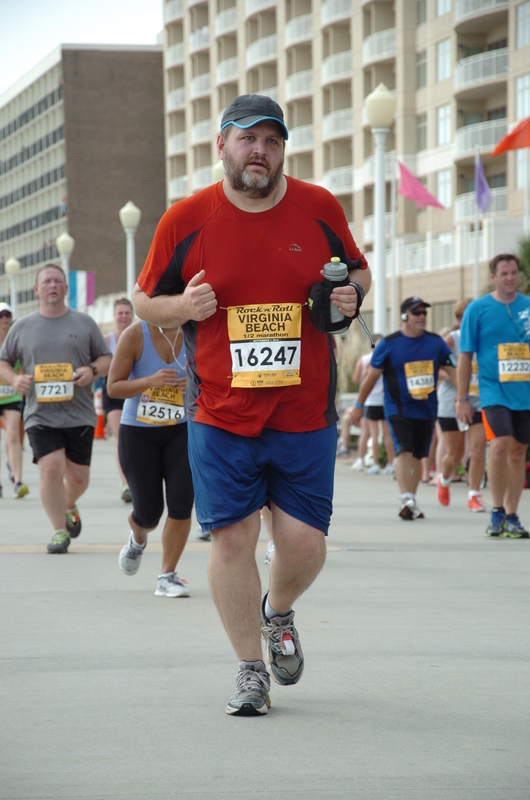 Short Version: I was warned (here http://boards.fool.com/so-rnr-half-is-an-ok-race-if-you-foll…) … but I did it. And the longer version isn’t all that different from the short version – it was a miserably hot and humid day. They’re reporting that one person died (though that wasn’t necessarily the heat … it happened at the first mile marker and there was a lot of blood, apparently) and thirteen people had to be taken to the hospital with things like dehydration, heat stroke, etc. A week ago they were forecasting a high of 80, and it wound up being more like 90 and brutal humidity. Yeah. My training, I think, was spot on. My really long run was a negative split 11-miler two weeks before the race. My taper went as planned, and I felt strong. I had the traditional pasta carbo-load the night before, and my traditional race morning breakfast of steel-cut oats. I couldn’t have done anything differently … I believe that. The race started “right,” too. Miles 1, 2, & 3 were all the exact same pace and were exactly my goal pace. Mile 4 was only 10 seconds slower, but that was the mile where we had the hill. And mile 5 was about 45 seconds slower, but that was the first water stop that I actually used (I was carrying a water bottle so skipped the first handful of stops). So, through mile 5, my times reflect that my race strategy was going perfectly. And then I completely melted down in Mile 6, and ran that mile and each subsequent mile nearly 2 minutes per mile slower than my goal pace. Holy crap. It was at the 10k split that I knew my “outside chance” goal was off the table, and by Mile 9 I knew my stated race goal was a goner. I and the people around me were like the walking dead at that point, shuffling through as best we could. By the time we got to the boardwalk for the last mile to the finish we were mostly only running when we saw photographers or because it just seemed like we should have. I’d expected a total zoo in the chute after the finish line, but it wasn’t so bad – tons of people and tons of help. I almost passed out at one point before I got some food in me. But, well, I did it. I found out my chip time when I had it engraved on the back of my medal – which is something I felt I should do for my first half-marathon – and I wound up being just under 10 minutes slower than my stated goal time. But some friends I was running the race with confirmed what Kevin said in the link above – EVERYBODY runs this thing 15 – 30 minutes slower than they normally would. Which means I’m ecstatic about my finish. Now for a bit of the personal before my usual notes – in April of 2012 I saw one of those pictures that you read about where I didn’t recognize myself, I’d gotten so fat. I stepped on a scale and the number scared me to death, and I signed up for Weight Watchers that week. I lost 35 pounds pretty quickly, but after a difficult summer gained 20 of it back just as quickly. I was in a funk and didn’t know what to do about it. And then a friend emailed me and told me about this Ragnar Relay he had just run and how much fun it was … and suggested that I might want to do it. And when I asked him if he thought I could, he said 100% and then said one of the more important things anybody has ever said to me. 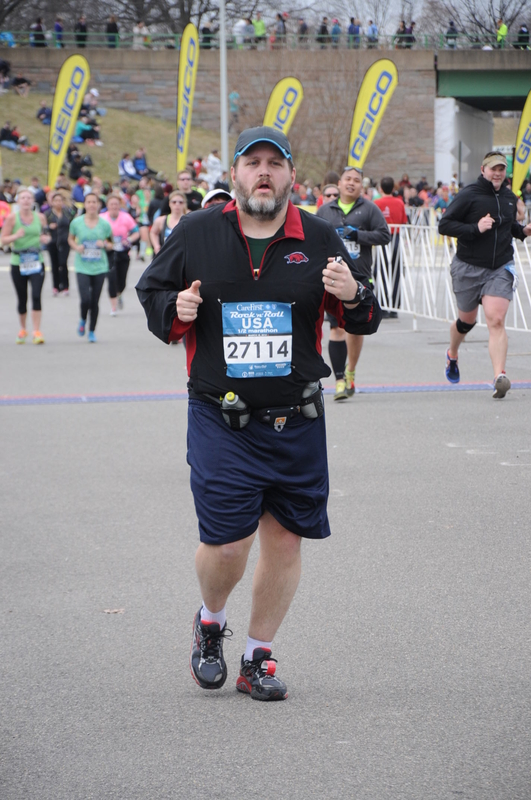 He said “and when you do, you’ll be one of the select few people who are able to say they actually followed through.” The running got me out of my funk, and since April of 2012 I have lost 55 pounds and completed a half-marathon that sent people to the hospital. And in October I’m going to run that Ragnar and follow through. – I either overestimated how much entertainment there was going to be on the course or underestimated how important my iPod is to my training – because I missed it badly. I listen to audiobooks, not music, so it is merely a distraction and not an adrenaline boost – but there were times I could have used the distraction. I now have to determine whether I want to stop using it during my training or go ahead and use it during all future races. – Even though I’ve spent years down there and I know it, it is always jarring to be reminded how much of a military town Virginia Beach is. The absolute best were the Navy guys at the Mile 5 water stop singing Anchors Aweigh – absolutely incredible. And there was also the man (and his daughters) running in honor of his son and carrying an American Flag through the race. To Kevin and all of the others on this board that have served or are serving – thank you for your sacrifice and your service. – That was the last time I’ll ever run in that pair of shoes – which is the only one I’ve had since I started back up. 415 miles on those shoes, which means 415 miles since last November. In the grand scheme of things that is a relatively small number. But two years ago it might as well have been 4 million. – I took nearly twice the GU that I normally do and it didn’t even move the needle. Did I mention it was hot and humid? – Of course, because this was a Rock ‘n’ Roll event, holy crap there was a lot of support. The race swag was cool, and this was my first race expo. Which I enjoyed a rather lot. I am irrationally excited to be in legitimate possession of a 13.1 sticker. – Having Frank Shorter at the start line was more motivational to me than I thought it would be. Seriously – there was an Olympic Gold Medalist right there. Smiling at us. – Seven months in a row running a race, with races scheduled for October, November, and December. I’ll get to 10, at which point, all bets are off. 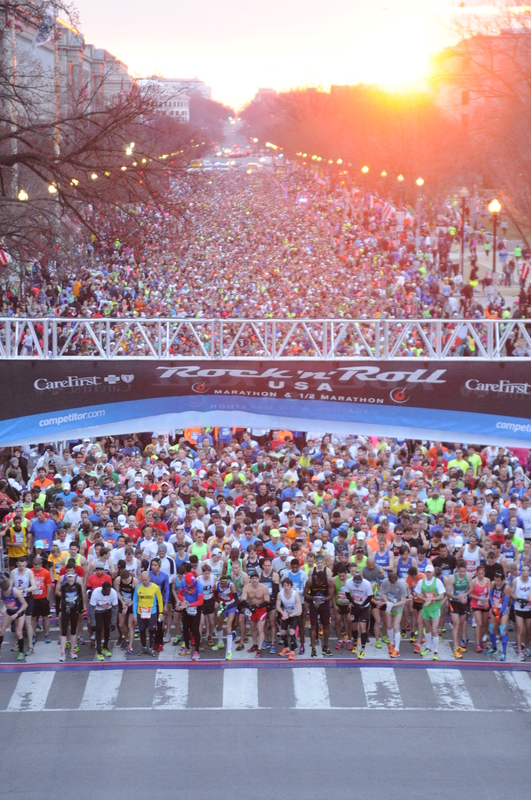 – I am officially announcing that I have signed up for the Rock ‘n’ Roll USA Marathon in March. It’s not that I’m partial to the Rock ‘n’ Roll folks, but more that the timing and the location worked with my calendar. My long runs are going to have to hurt less than that half did for me to stay excited about that distance. – Next race: Celtic Classic 5k … and I intend to improve my 5k PR by several minutes. Seriously – I’m going to try and bomb this one.